MOHAN Foundation’s core activity is to provide support, knowledge and encouragement to those touched by organ and tissue transplantation and to inform the public about the need and benefits of organ and tissue donation. Our relentless efforts through public awareness campaigns have resulted in creating a “feel good” factor among the public on deceased organ donation. Join us and support organ donation. There are multiple ways we can engage you in our work depending on your situation. Become a Life Member to advocate for organ donation and get our kit along with regular updates through our newsletters. Become a Registered Member through our website and access useful validated information on the subject. Pledged Member through our website and carry an organ donor card and share this with others to encourage them to join too. There is now a family pledge card too available on the site. Volunteer for the foundation – give us your time to spread the message– could be for a few hours every week. Join us on Social Media sites Facebook and Twitter. 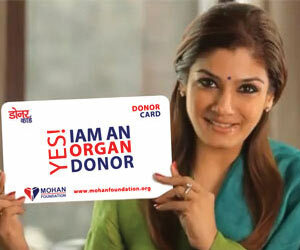 Showcase our Donor Card App (iphone & Android ) on your smart phone. We always encourage new groups in new regions to take up advocacy.